Google Finance enables users to view and manage stock portfolios. Google provides an HTTP API that allows clients to interface with the application. 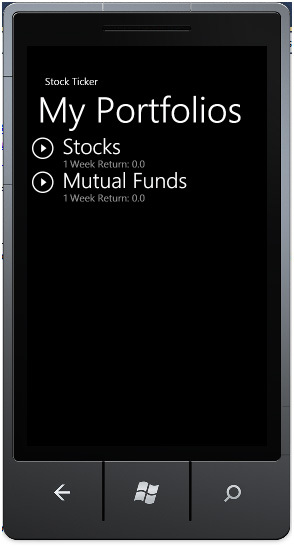 With the release of the new Windows Phone 7 operating system, creating a portfolio viewer application is a great way to learn a new set of tools. 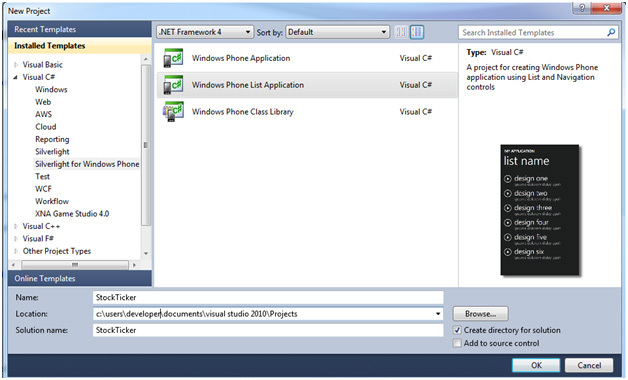 Download the Windows Phone development tools—they integrate nicely into an already installed version of Visual Studio 2010. Alternatively you can use an Express Edition of 2010. You should see a split screen designer for MainPage.xaml. This is the opening list page of the application. 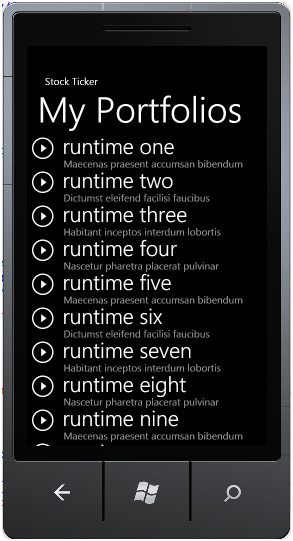 On the side with the XAML code, update the TitlePanel section to give your application a new name. Now that you’ve seen your application run in the emulator you must authenticate to the Google Finance API. I used HttpWebRequest to handle all the calls. Using the WebClient class could also work and might be simpler, but I prefer the control that HttpWebRequest provides. The following code illustrates sending a HTTP POST to the Google client login service and reading the response. For simplicity, I put all my code in the MainViewModel.cs file. To see what the response is, paste this code into your project and call the LoadItems method from the OnNavigatedTo event in MainPage.xaml.cs. The Auth section is the only one we care about, so I parsed it out and assigned it to a private variable. All subsequent requests for portfolio and stock data will require it. Now that we can authenticate to the Google Finance service, we can start retrieving stock information. First, set up your Google Finance account with some test portfolios if none currently exist. The call to retrieve your portfolio feed is significantly simpler than the authentication call—it’s a simple GET request with the Authorization header set to the previously returned Authentication Token. The resulting response is an XML doc detailing your portfolio feed. Now, let’s bind it to the list displayed in the MainPage. LINQ to XML provides a simple way to parse the response and create the list of items to bind to. This invokes the update on the UI thread which does not throw System.UnauthorizedAccessException: Invalid cross-thread access error. An additional gotcha about parsing the response from Google is that the XML has a specified namespace, so doing something like portfolio.Descendents(“entry”) won’t work. You have to use the fully qualified name which you can do by using XName.Get with the elements specified namespace. If you click on an item you will automatically navigate to a detail page which will just display the portfolio name right now. In future posts, I’ll detail binding this page with specific stocks and making the app look great. If you have any questions or interesting alternative solutions please post them in the comments below. Thank you for sharing this… !!! Very Helpful for Newbies !!! Thanks a lot for sharing this. I was looking for how to post back on UI thread. This was very helpful! Possible to post the source code here? Can you plzzzzzzzzzzz share the code? Any similar apps for Google doc client? See the update at the top of the post for a link to the source code. Is there a zip file avaiable of the completed app? Thanks for taking the time to put this example code into a well formed blog post. Got me up and running with a functional app using http GET / POST within 20 minutes!